You are right, I took them on the 10th of March. After that little outing, I got promptly waylaid again by that obstinate, insidious bug that has me in its grip for three weeks now. Very stylish red wheels and the horses are very trendy. Apparently plaid is very in this year plaid trend 2013. I think it would not be too far off the mark to imagine noblemen of two centuries ago outfitting their carriages with harnesses and bridles by Thierry Hermès and the finest wool plaids from Scotland. Il n'y a plus de neige chez vous, à Vienne ??? En Normandie, elle nous aime beaucoup cette année!!! Good day for you !!! It snowed for almost 24 hours straight. Winter's stubborn this year! Let's wish for spring to finally conquer the icy journeyman for good. After all, the ides of March are upon us! I love that they wear bowlers. This is a particularly well dressed coachman, isn't he? I will have to get some pics of the horse and carriage tours in the French Quarter here. Great captures and I wish I were there to take a ride! Thanks for sharing, Merisi, as always! Hope you have a lovely weekend! I feel like I'm looking at a movie set. The same here, I could not help but wait and observe the ever-changing scene. 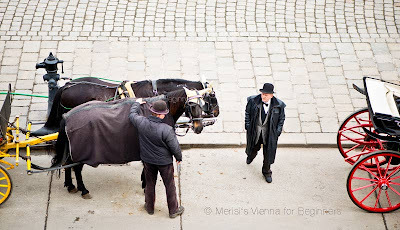 Awe, we have carriage rides in Louisville, KY, but somehow, I think that the carriage rides in Vienna, would be so much more wonderful! Fascingating photographs. It takes much patience in that line of work to get customers sometimes. Surely not the easiest way to earn one's keep! Wien ist :-), coole Stadt. I imagine camellias blooming in Louisiana, even azaleas. May it come true soon! Merisi, as always, your photos tell a fine story. I do like this overhead view, and as always, am curious where you and your camera were located. It pleases me that there are two horses waiting to pull this carriage and its potential passengers rather than what happens here in NY. I am always sad to see just one noble horse being required to pull a carriage with driver, and two or more passengers through Central Park. I remember taking a carriage ride through Central Park, and being disappointed when the ride ended way too fast! One horse, two horses, no memory left. Beautiful scenes. I bet it would be pleasant to go an a carriage ride there. I have yet to experience a ride here! Mysterious, somehow -- looks like a play just about to begin. That last photo could be out of another century, I love it! I really like the balance and composition of the second one here. Nice shots! What a beautiful carriage. Wonderful shots! Happy sky watching. Lovely carriage and story vignette. Wondering where you took these (from above)? Yes, I was standing on top of a staircase. Wonderful pics! Thanks for shareing! 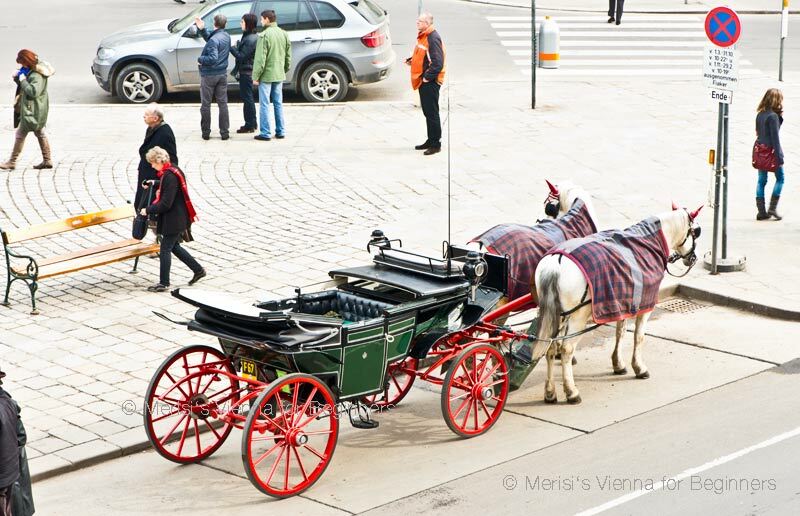 It is always a pleasure to look at your vienna impressions! Have a wonderful weekend! Take care, Doris L.